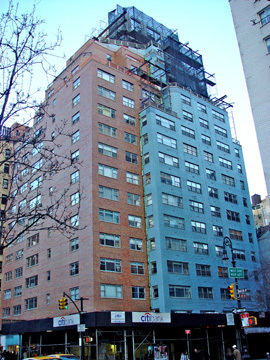 This 17-story building had the distinction of being the only light blue-brick, high-rise, residential building in Manhattan. Like much in the city, however, that distinction was short-lived for in 2001 it was reported that the building would change the color of its brick façade. The Museum Tower on West 53rd Street adjacent to the Museum of Modern Art has some blue glass on its facades, and the Mondrian on East 53rd Street also has some deep blue glass on its facades, and there are numerous pre-war buildings that have some blue in their terra-cotta decorative façade elements, but only this building was bold enough to experiment extensively with blue masonry above the first floor. It was erected in 1963 and converted to a cooperative in 1984. It has 83 apartments. 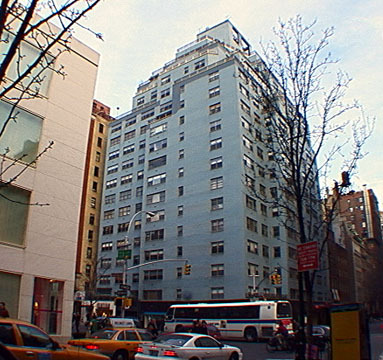 The light blue color is not unattractive, and somewhat of a relief from the more commonplace white- and gray-brick buildings that proliferated in the late 1950's after the success of Manhattan House, the large white-brick, full-block residential complex between Third and Second Avenues and 65th and 66th Streets. White became popular because it signified modernity and because it "lightened" the urban palette. 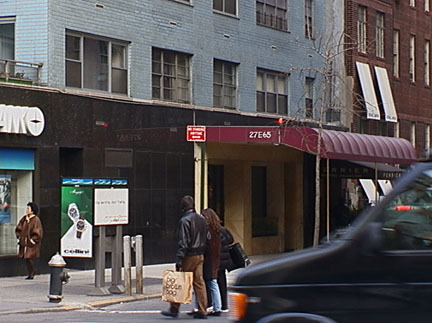 For about a generation, most new "luxury" residential high-rise construction in the city imitated Manhattan House's light-colored facades, although few matched its lush landscaping and extensive, transparent lobbies and strong massing. In time, such construction, which was generally devoid of pre-war detailing, fell out of favor because of its architectural blandness and the emerging popularity of Post-Modern designs, first, and new modern architecture, secondly. There is no reason that urban architecture should not have a full palette of colors, but developers and lenders tend to be conservative and not surprisingly have concerns about the effect of exotic colors on their marketing. There are a few "dark" buildings and one might argue that a deep blue façade might be quite interesting. It could be argued that light-blue buildings "fade" into the sky, often, but a more important concern, especially in recent years with heightened interest in historic preservation, is the nature of the neighborhood context. Does a chosen façade color clash with or compliment its neighbors? A couple of white-brick apartment houses on the Upper East Side - 35 East 85th Street and 7 East 86th Street - opted to replace their facades with red bricks at the start of the millennium, an indication of disenchantment with such facades, part of which is also explained by the fact that many of the older "white" and "gray" brick facades had significant "spalling" problems in the city's freeze-thaw cycles that caused major façade maintenance problems. This building has a prime Upper East Side location that is very convenient to the Midtown office district as well as the fashionable boutiques, restaurants and art galleries on Madison Avenue. Central Park is only a block away to the east and because it is across from the low-rise Giorgio Armani store on Madison Avenue, this building has considerable "light and air" as well as many good views. The side-streets in this vicinity are among the finest in the city and a subway station is not far away at 67th Street and Lexington Avenue. This building has a one-story, polished black granite base and a taxi lamp at the corner. It has a curved red canopy and high-end retail spaces. Ferrier, a restaurant, occupies part of its sidestreet frontage. It has a garage, a doorman, discrete air-conditioners, sidewalk landscaping, consistent fenestration and some terraces. There is considerable traffic on Madison Avenue and the building has no balconies. A July 2, 2004 article in The New York Times reported that "After a two-year court battle, workers are moving ahead to strip the signature blue bricks off the facade of the co-op apartment house at 27 East 65th Street, at the corner of Madison Avenue." "A panel of the Appellate Division of New York State Supreme Court ruled this month in favor of the co-op board in its long-running dispute with Elliott E. Sutton, 62, a real estate investor who controls the building's ground-floor commercial space as an equal partner with the co-op board."